Shortly after midnight on June 6, 1944, Allied paratroopers jumped out of their planes and into the darkness behind enemy lines in the French coastal region of Normandy. As they floated down, they were sitting ducks as the Germans fired at them incessantly. Since they could not use their weapons while parachuting in, all they could do was hope and pray that they would land safely in the correct drop zone. Their mission was to destroy as much German artillery as possible to ensure the success of the incoming amphibious landings at dawn. The paratroopers accomplished their goal, and at dawn, thousands of Allied soldiers landed on the beaches of Normandy. Although the Allies lost many good men that day, by the end of D-Day, that day of days, they had secured the beach head and moved their offensive against the Germans to the east and to the south. The initial plan was to bypass Paris, but the French soldiers were very persuasive, and Supreme Allied Commander General Dwight D. Eisenhower gave his permission for the Liberation of Paris. 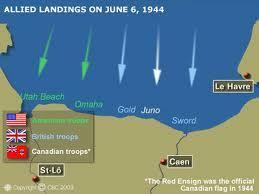 Map of Allied Landings on "D-Day"